Commercial label printers - print custom GHS and chemical labels. Full color GHS-compliant and BS5609 approved labels are produced on-demand directly from your label authoring system/software. Continuous label printing is available for fan-folded and roll-to-roll label stock. Capable of automatic feeding and cutting of continuous label media. Prints up to 50, 8.5x11 labels per minute. Integrates with most graphical label creation software including SAP on Windows, Apple, and Linux, including SAP, GLM, and Loftware. Design and print your own high quality custom labels in house with the digital NeuraLabel 500e laser printer. 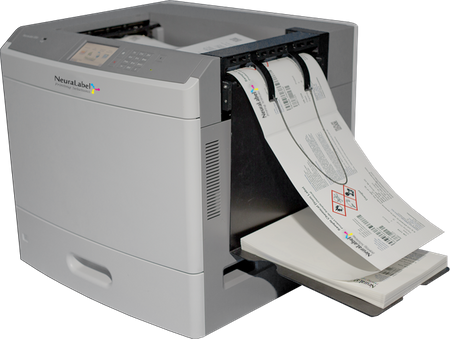 The NeuraLabel 500e is a flexible and reliable drum label printing solution that offers one-pass, 4-color printing, and GHS-compliant labels that are readily produced with laser sharpness. Easy access, high-capacity toner cartridges ensure that your printing is uninterrupted by frequent cartridge changes. The versatile and dependable NeuraLabel500e is compatible with almost any label media available on a roll, while also able to print on fan-folded as well as sheeted media. ** Only labels conforming to the required specifications, including registration marks may be used. BarTender - Design and print software for labels. www.seagullscientific.com Neuralog is an authorized reseller of BarTender, the world's leading software for label, barcode, RFID and card printing. BarTender together with the NeuraLabel printer gives customers a unique and integrated software and hardware solution for printing GHS-compliant chemical drum labels. Loftware Label Manager - Industrial strength label design and printing. Loftware Print Server (LPS) - Server-based software solution for managing and processing label print requests from corporate applications. Microsoft Word 2007 and later have been tested with NeuraLabel. Whether you are using a label template or a simple word document, the pages will be printed one page per label on continuous label media. Adobe Reader X has been tested with NeuraLabel to print PDF files. This is a free download from Adobe. Whether you are using a label template or a simple PDF document, the pages will be printed on page per label on continuous label media.